The Li-Fraumeni Syndrome Association (LFSA) supports families and individuals with LFS in ways that touch lives and inspire change. Our efforts concentrate on raising awareness in the community, advancing medical and scientific research, and uniting patients and professionals who share our same goal. We are proud of our collective efforts, significant impact and new milestones reached in 2014. It is my pleasure to share our first annual Impact Report with you. 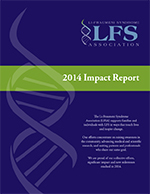 This report highlights the accomplishments of the LFSA in 2014 as we work to improve the lives of those with Li-Fraumeni Syndrome. We are achieving this by supporting the ambitious advancement of the scientific understanding of LFS, sharing information and connecting the LFS patient and research communities. Thank you for sharing our vision and lending support to our organization and its efforts. This work would not be possible without each and every one of you. I would like to also take this opportunity to thank the LiFE Research Consortium for their ongoing commitment to collaborative research to improve the understanding of LFS and the care of those affected. With this collective investment we are unraveling the complexities of LFS and truly changing the futures of those individuals and families with this syndrome. Please visit our website for updates on our progress. We are grateful for your support and I am excited and confident that our upward trajectory will continue in 2015. In 2014, LFSA launched its grant program to support leaders in the medical community who are pioneering research initiatives in LFS. We are proud to have awarded two grants totaling $80,000 to esteemed innovators who have dedicated their lives to advancing our understanding of LFS. Together, we will improve the diagnosis, treatment and outcomes for LFS families. There is currently no standard method of screening individuals with a diagnosis of LFS, however an optimal screening tool is desirable to detect cancers at an early stage when they are more easily treated. Dana-Farber Cancer Institute has an open research protocol (screening with whole–body MRI for the detection of primary tumors in children and adults with LFS and other cancer predisposition syndromes) utilizing a relatively new medical technology called Whole Body Magnetic Resonance Imaging (WB-MRI) as a screening tool. Adult oncologist Dr. Judy E. Garber and pediatric oncologists Drs. Allison O’Neill and Lisa Diller are collaborating on this effort with radiologists Drs. Stephan D. Voss and Jyothi Jagannanthan. This Whole Body MRI allows doctors to examine the entire body with one non-radiating scan. Eliminating radiation (which is typically associated with PET and CT scans) is particularly beneficial for individuals with a high risk of cancer due to LFS. Over time, the research group hopes to learn more about whether this imaging modality is useful as a screening tool. Please contact the pediatric or adult oncology departments if you have any questions about this study or are interested in participating. The research supported by the Li-Fraumeni Syndrome Association (LFSA) will include several projects in Dr. Schiffman’s laboratory related to LFS and cancer risk. Specifically, Dr. Schiffman is working to develop a clinical test to measure the risk for developing cancer. This test can be applied to LFS family members and help to guide clinical screening for early tumor detection. In addition, Dr. Schiffman is studying elephants and the observed phenomenon that elephants rarely develop cancer (despite their very large body size). Dr. Schiffman’s laboratory is trying to understand the genetics behind cancer protection in elephants and how to apply this knowledge to children and families with LFS to prevent cancer. In 2014, we provided three patient education webinars that reached more than 300 community members. Webinars engaged and educated people about LFS on topics from nutrition to recent findings in LFS research. LFSA serves as the voice for the LFS community through our engagement and participation in major medical conferences. In 2014, we delivered our key perspective to the broader medical community through presentations at two events. Presented by Dr. Robert Lufkin, LFSA Scientific/Medical Advisor at the 2014 U.S. Oncology / McKesson Specialty Health GREAT Genetics Educational Conference in New Orleans, LA. Presented by Jenn Perry, LFSA President at the Genetics for Nursing Conference at Dana-Farber Boston Children’s Hospital. Our web presence serves as the hub connecting the global LFS community. Our website offers LFS education, resources, clinical trial information, patient support, and a community forum. LFSA is raising awareness through unique events that involve a wider audience and provide venues for public advocacy. Thank you to all of those who came out to show their support. On June 10, 2014, LFSA Scientific/Medical Advisor, Dr. Robert Lufkin, was honored by Massachusetts General Hospital Cancer Center’s “the one hundred” event. The event honors 100 researchers, caregivers, advocates and philanthropists who have dedicated themselves in the fight against cancer. The LFS Community rallied around our LFSA Virtual Walk. 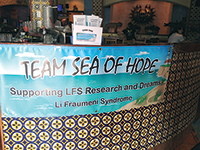 In June 2014, LFSA friends and virtual walking team “Sea of Hope” hosted two fundraising and awareness initiatives at Margaritas Restaurant in Framingham, MA. A percentage of the restaurant’s sales went to LFSA, and more than 300 restaurant goers learned about LFS. At LFSA, we are proud of the impact we have made in 2014. We look ahead to 2015 to be an even more productive year in helping individuals and families with LFS. We look forward to being joined by even more supporters working towards a future without LFS. Our work at LFSA is only possible through the support of our donors and champions, who have facilitated the advancement of the LFS agenda beyond measure. We are indebted to Wilma and Don Sackett and all of our donors for their contributions. on January 28, 2015. Please join us and learn more about LFS at LFSAssociation.org.